Beginning March 10, 2010, 7-Eleven Philippines will be giving the entire Filipino nation a voice in the upcoming Presidential elections through the 7-Elections. This 7-Elections was launched by 7-Eleven Philippines on March 2, 2010 at the Rockwell Tent. This event was hosted by David Celdran, with Ate Glow as a "guest of honor." 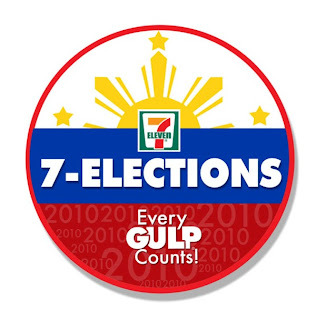 It's important to note that with the various forums & debates being initiated by the major Philippine TV networks, 7-Eleven is here to test the pulse rates of the customers on who among the Presidential candidates have the nod of the voting public. "7-Eleven in the USA first conducted this in 2000 and has run for three consecutive elections," explains Jose Victor Paterno, President and CEO of Philippine Seven Corporation, Philippine licensee of 7-Eleven stores. "Partnered with two of the most prominent news networks in the U.S., CNN and USA Today, the informal polling was able to provide the public with daily and weekly poll results." While the poll may be informal, evidence from its U.S. precedent revealed surprisingly accurate results— revealing a one to two percent discrepancy between actual numbers from U.S. Voters versus 7-Election participants. In the same vein, the local 7-Election is set to provide Filipinos a fun and informal Presidential polling platform that not only makes it more accessible for the voting public to make their voices heard, but introduces the concept of choice and responsible voting to a wider demographic. Locally, 7-Eleven hopes to highlight the Filipino's Presidential options by making sure that all the Presidentiables - the top five (note: based on a survey), namely Manny Villar, Joseph Estrada, Richard Gordon, Noynoy Aquino, and Gilbert Teodoro alongside fellow candidates Jamby Madrigal, JC de Los Reyes, Nicanor Perlas, Eddie Villanueva, even the voter's right to abstain, are represented. The idea is to engage the greater public in this national initiative anchored on the value of freedom of choice and underscore the importance of responsible voting. 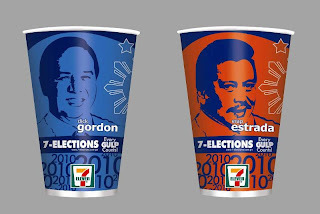 Personally, I was surprised and disappointed that one of my strong choices (besides Gibo Teodoro), Eddie Villanueva doesn't have his own Gulp cup, and that Joseph Estrada gets to have his own. Isn't that absurd? I had an interesting chat with James Ranada of 7-Eleven and he told me that the Presidential candidates were assigned their Gulp cups based on a survey done. The top 5 in the survey gets to have their own cup, while the bottom 5 candidates share in just 1 Gulp cup. Unfortunately, Vetaliano Acosta was removed from the presidential race, but his picture still appears in the cup. 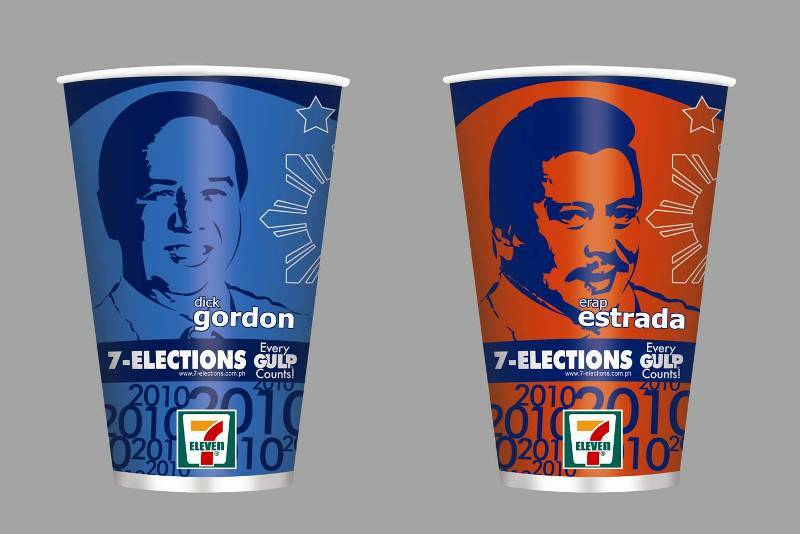 "For the duration of the campaign, anyone who wants his vote to be counted can just visit any 7-Eleven store and pick up a 16oz Gulp® Cup that bears the colors and image of their Presidential bet. And we're making it easier and accessible for Filipinos to let their voices be heard by making it available in over 450 stores." he explains. 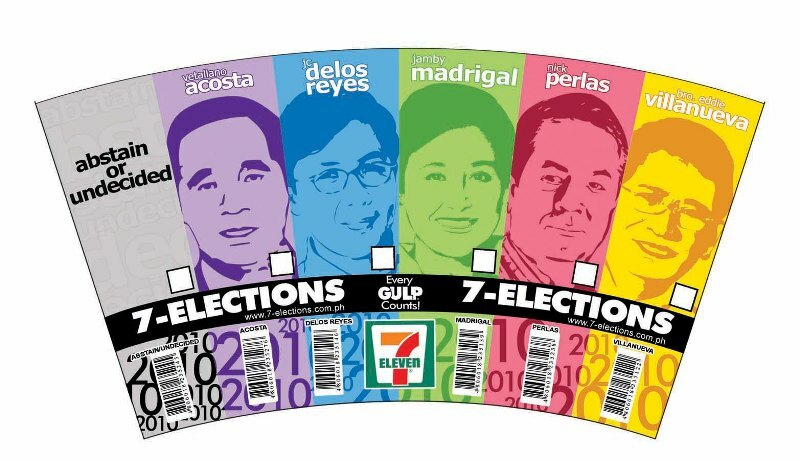 To ensure the veracity of each vote, each Presidentiable is assigned a specific barcode, which 7-Eleven cashiers will scan upon purchase of your Gulp® cup. All votes are carefully audited and may be verified online at www.7-election.com.ph where the public can also view updates on detailed polling results, to give the public regular updates on the Presidential race. Voters may even share their vote thru Facebook. "This has the potential to provide a pulse on the upcoming National elections. Our strong network of over 450 stores caters to Filipinos from all walks of life and may offer a good indication of how the real elections will turn out," ends Mr. Paterno. And because Every Gulp® Counts! Filipinos can literally drink to their candidate. Add 7-Eleven's Facebook Fan Page & 7-Eleven's Twitter.